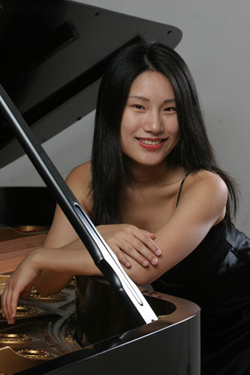 Xiayin Wang arrived in the United States from her native China in 1997, she had completed studies at the Shanghai Conservatory and garnered an enviable record of first prize awards and special honors for her performances throughout China, most notably in the Fu Zhou National Piano Competition, Hang Zhou Instrumental Competition, Zhe Jiang Competition, and the National Piano Competition in Beijing. She was heard with some of China's leading orchestras, including the Beijing Opera House Symphony and the Zhe Jiang Symphony, and in many of the country's most prestigious concert halls. In addition to her performances in China, Ms. Wang has been heard in Europe with the Tenerife Symphony of Spain. 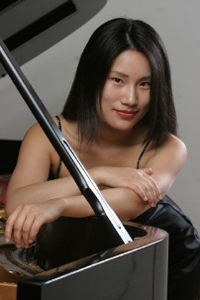 Ms. Wang, who began piano studies at the age of five, subsequently came to New York where in 2000 she was awarded the "Certificate of Achievement" by the Associated Music Teacher League of New York, winning an opportunity to perform at Carnegie Hall's Weill Hall. She also pursued studies at the Manhattan School of Music and won the school's Eisenberg Concerto Competition in 2002, as well as the Roy M. Rubinstein Award. Ms. Wang commands a particularly eclectic repertoire, ranging from Bach, Mozart, Beethoven, Chopin and Liszt to such later masters as Debussy, Ravel, Rachmaninoff, and Medtner, and modernists like the American George Perle. She has had unusually wide experience as a chamber music pianist, with a special interest in the chamber works of such French composers as Fauré, Ravel, Poulenc, Messiaen, and Dutilleux. Ms. Wang has been invited to perform at masterclasses given by many renowned piano teachers, including Byron Janis, Eugene Istomin, Ramzi Yassa, Yefim Bronfman, David Dubal, and Joseph Kalichstein. An active recitalist, during the 2005-06 season Ms. Wang was heard in Florida, Arizona, New Jersey, and at Lincoln Center's Alice Tully Hall in New York. 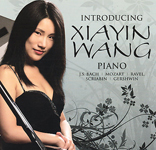 Xiayin Wang holds a Bachelor's Master's and Professional Studies degree from the Manhattan School of Music, and is now completing her Doctorate at that institution. Her principal teachers have included Dr.Solomon Mikowsky and Nina Svetlanova.